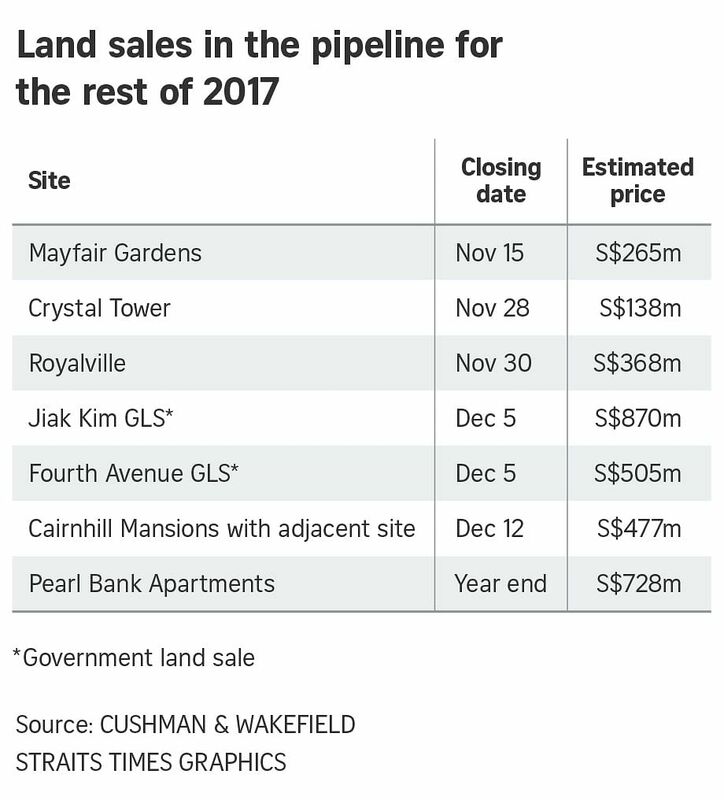 SINGAPORE (BLOOMBERG) - A series of blockbuster land deals in Singapore this year signal the city-state's property market is set to break out of its prolonged slump in 2018. "Singapore's residential and office market has passed its inflection point, embarking on an exciting recovery journey," said Christine Li, a director of research at Cushman. "With brighter economic prospects and improved market sentiment in the next two to three years, developers are increasingly sourcing land sites to ride the wave of growth for the rest of the decade." Brokers including Cushman and CBRE Group Inc. predict office rents will climb 7 percent to 9 percent as an oversupply of space eases. The resurgence in deals suggests Singapore is on course to emulate Hong Kong's red-hot property market, where home values have surged to record highs - following a jump in land prices last year - and office towers have fetched eye-popping prices. With housing-affordability much better in Singapore, there may be a surge in demand next year, according to BNP Paribas. "Singapore's property market has largely turned the corner, underpinned by a brightening economic outlook," Tay Huey Ying, head of research & consultancy at JLL Singapore said. Residential and Grade A office assets are poised to remain investor favorites for the rest of 2017 and 2018, she said.